We had a great time last weekend at the Waldorf Constantia Fair. Terri sold her knitted gems and her organic essential oil, her hubby, Greg had his painting portfolio on display [wow his work is good!] . I had my weaving and naturally dyed wool for sale and Kalla sold his honey. The children had a fantastic time running up and down the slopes surrounding the school field. Gosh I love all the colours that can be dyed naturally! Many more pictures are on my family blog. As a child I spent many special days french knitting,. These are my first memories of my creative ability. So with a warm and nostalgic heart I assembled these kits. 15 g Hand-dyed bamboo in 14 different colours. As usual this kit comes with full instructions and is packaged in a reusable organza bag and sell for R25-00. Hope you like these sweet kits. Another knitting kit that is available on order from me. The wool is dyed with cochineal and the wings are cut from hand made felt. This kit sells to group members for R25-00. They are Suez's gnomes! So Viva AFRICA! Rush over and join before it is so late. 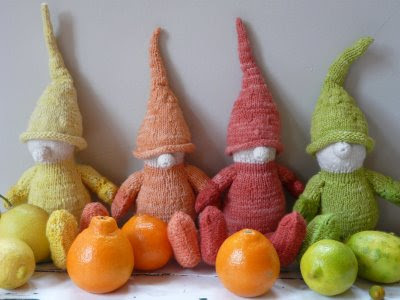 Terri has been making these lovely gnomes and is selling them for R10 - R25 depending on the size. They are made from handmade felt and merino rovings. I really like her Red Riding Hood it is approx 12cm tall so is a nice size for the nature table or play. It is also made from Merino rovings and Handmade felt. I bought this one for R35-00 and she has 2 more for sale. If you want to order from her or ask any questions [like - when will her book be ready! lol], she can be mailed on terriashleycooper@gmail.com or you can mail her on group. I have been having great fun with NATURAL DYES and decided to sell sweet little knitting kits. The first kit is for a mamma duck with an upturned tail. Her final size is approx 10cm long by 8cm wide. In my need to always recycle, I decided to package it is a reusable 10cm x 15cm organza bag. These sets are for sale for R25-00 each. I am so excited about how this little guy turned out! I have decided to make a whole range of little needle felted animals for my shop. I have added him to my Etsy for Easter. The blog is a record of the creativity in the South African Waldorf Homeschool community. Please respect this and do not copy photos, patterns or text.